We flew to Atlanta, Georgia (16 hours) and then to San Francisco, California (a further 5 hours). California’s “legal” population is 38 million, which is comparable with South Africa’s population of around 50 million – with the difference that California is the 12th biggest economy in the world. 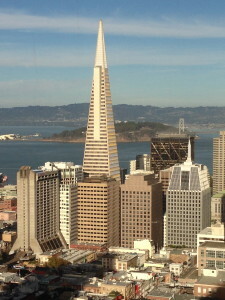 It is well known that some of world’s largest corporations are headquartered in California (Google, Apple Inc, Cisco Systems, Yahoo to name a few) and for that reason, the state of California is the leader when it comes to developing world class, modern legislation, which the rest of the US and the world follows. In particular, being the state with the highest concentration of global tech companies, the world’s most up-to-date and fast developing privacy laws originate out of California. This was my first time in the USA, and my experiences of the country can be summed up below. I am in agreement with many of the people whom I came across (both Americans and internationals) that San Francisco is one of the most beautiful cities in the world. Although the city is very cosmopolitan (with a third of the population of east-Asian origin), you still come across faces that look like they have come straight out of a Western. Another observation was that the down town police cars seem to be stuck in 80’s – 90’s era with their black bonnets and boots, white roofs and red and blue lights, reminiscent of a low budget action film. Although there is almost no police presence in the crowded streets, I felt safe in the city at all times. From a visitor’s perspective, I think it is a great place: friendly people, very diverse cultures, a lot to see and do, and very relaxed. It is generally regarded as an expensive city, but still cheaper than Europe. A 330 ml can of coke will cost you about $3, a beer $6, and a ham and cheese Panini roll about $7. The big attractions are the Golden Gate Bridge, and the most famous jail in the world, Alcatraz. With regards to our SCG meeting, one of the very interesting topics discussed was the Right to Privacy and the regulatory law relating thereto, specifically in a global Internet and shared – information context. For the purposes of this update I won’t go into much detail, but for interest sake, in the criminal underworld, it is possible to recruit a hacker to create an untraceable new virus to slip through any anti-virus in the world for as little as $5000, or you could hire a hacker at $2 an hour to steal information for you (for example from a competitor or a government). Data theft is big business, it is happening all around us every day and, as explained, it comes cheaply. Therefore it is advisable to consider your IT system security, especially data privacy security, very seriously as you are most likely experiences data security beaches more often than you think. On the other side of the coin, protecting and upholding your customers’ private information is also incredibly important in today’s modern internet age, under the fast developing Right to Privacy laws. There is legislation which is likely to be implemented in the European Community which imposes sanctions of up to 2% of an infringer’s global turnover for certain data breaches or unreasonable conduct in regards to the use of private information. Can you imagine the penalty which could be imposed on companies like Amazon or a global bank! We will provide a detailed technical write up on the impact of these new privacy laws in due course. I also took part in an interesting session on the importance of the tool of negotiation during complex disputes, which was very insightful and entertaining. Another session was presented by three general legal counsels of some of the world’s biggest global companies, namely Hewlett Packard, Jelly Belly beans, and Tesla motors (of which South African born Elon Musk is the CEO). It was quite surprising that two out of the three speakers regarded the personal relationship with the individual lawyer of their external counsels, as the highest motivator for choosing an external counsel firm, and not actually the brand of the external counsel firm or its reputation – they prefer dealing with likeable and outstanding individuals who get the job done in an efficient and friendly way. Another imperative is that the individual lawyer should be an expert in the subject matter of the legal needs of the company, and must have fast turn- around times. Another interesting point for me was the popularity of the role of the lobbyist in the legal fraternity in the USA. There were a number of lawyers who attended the conference who practice only as lobbyists. Big corporates will pay these lobbyists an annual retainer fee to try to influence politicians and the state legislators on matters which are of key importance to them, for example a soda beverage company may be concerned that they are being taxed too much in certain states (as their beverages don’t stand up to the required level of health standards), in which case, it would be the task of the lobbyist to try and influence the relevant politicians to ensure that either no tax, or a lower tax, is implemented in that state. It must be quite a remarkable thing to influence policy makers and sway them into acting in your favour, for a living. For these guys, winning over important people’s trust is second nature to them. Over the course of the weekend, I met and spent time with colleagues from all over the world, from Finland to Peru, from Canada to Taiwan, and had the privilege of sharing ideas, experiences and jokes. We are very pleased with the quality of all the member firms who attended. All the firms are top firms in their respective jurisdictions, which gave us a lot of comfort. How do we weigh up? It would not be appropriate to compare firms from a technical subject matter perspective, but in the closed meeting groups, I believe our thoughts and decisions are well in line of the top global firms: we are treating our clients the right way and the fact that our model is based on adding value to our clients’ businesses was highly respected by everybody. South Africa is widely recognized as a very attractive investment jurisdiction and the two of the general counsels who presented at the conference (who represent global businesses) indicated to me that they are working on expansion into South Africa. We are fortunate that our practice is well respected in the SCG Legal Group for what we are achieving. I unfortunately didn’t meet many people who had visited South Africa, however those who had, only had great things to say. The only specific questions I received were about the political environment (which I believe flairs up now and again as is the case in every emerging economy, however is not of grave concern to us) and the stability in the mining sector post Marikana (which has fortunately subsided) and other general enquiries regarding Nelson Mandela’s health. The San Francisco cementing was an unbelievable experience, and it is a huge eye opener spending quality one-on-one time with some of the most prominent lawyers and legal counsels in the government and private sector in the world. It is so important to take and learn from the best of what we have been exposed to in order to add more value to our clients.